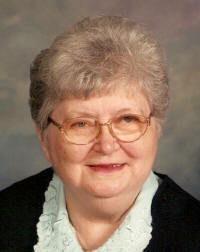 Henrietta M. Klostermann, nee Steinmann, 85, of St. Rose, died Friday, February 23, 2007 at St. Joseph Hospital in Highland. Mrs. Klostermann was born October 11, 1921 in Madison County to Henry and Mary (Benhoff) Steinmann; they preceded her in death. She married Cornelius Klostermann on October 20, 1948 at St. Rose Catholic Church; he preceded her in death on February 20, 1978. Also preceded in death by a brother, Otto Steinmann; sisters, Augusta Steinmann and Alvina Kampwerth; brothers-in-law, George Korte and Edward Kampwerth. Surviving are her children Leonard Klostermann of St. Rose, Gervase (Kathy) Klostermann of St. Rose, Elaine Klostermann of St. Rose, and Glenn (Barbara) Klostermann of Troy. 6 Grandchildren-Kristy, Kyle, and Kelly Klostermann, Paul and Keith Barackman, and Blake Klostermann. A sister, Veronica Korte of St. Rose. Henrietta was a homemaker and a member of St. Rose Catholic Church and Altar Sodality. Funeral Mass of Christian Burial will be Tuesday, February 27, 2007 at 2:00 PM at St. Rose Catholic Church in St. Rose with Fr. Edward Schaefer officiating. Interment will follow in St. Rose Cemetery. Visitation will be Monday, February 26, 2007 from 4:00 to 9:00 PM and again on Tuesday, February 27, 2007 from 11:00 AM to 1:30 PM at the Moss Funeral Home in Breese. Memorials can be made to St. Rose Church or to the American Cancer Society and will be received at the funeral home.